If you’re looking to add valuable living space to your Williamstown, New Jersey, home, we invite you to consider the wide variety of outdoor rooms available at SRA Home Products. We proudly install outdoor rooms exclusively manufactured by TEMO, a leader in the national outdoor living industry. Our outdoor rooms are available in multiple styles, including California, cathedral, conservatory, Santa Fe, solarium, and studio. They come in multiple colors, including white, sandstone, and bronze. Our outdoor rooms come standard with HPG 2000 glass, which is four times stronger than annealed glass. Although it offers an SPF of 59, you can choose to have this upgraded to an SPF of 85. You can select from multiple window systems, including the prime window system and the window wall system. You can even choose between single- and double-pane glass options. If you’re looking for even further customization, you can choose a model from the Nino Vitale Signature Collection. 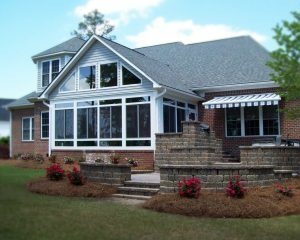 With options such as knee walls and matching brickwork/siding/roof styles, you’ll be able to achieve full architectural integration with the style of your home. For more information about how you can customize our outdoor rooms to match your Williamstown, NJ, home, please contact SRA Home Products today. Since being founded in 1988, we’ve completed more than 5,500 projects, and our continuing dedication to superior craftsmanship and outstanding customer service has allowed us to earn an A+ rating from the Better Business Bureau.